Fulton, NY - The first Fulton Block Builder check is presented to the Stoutenger’s. 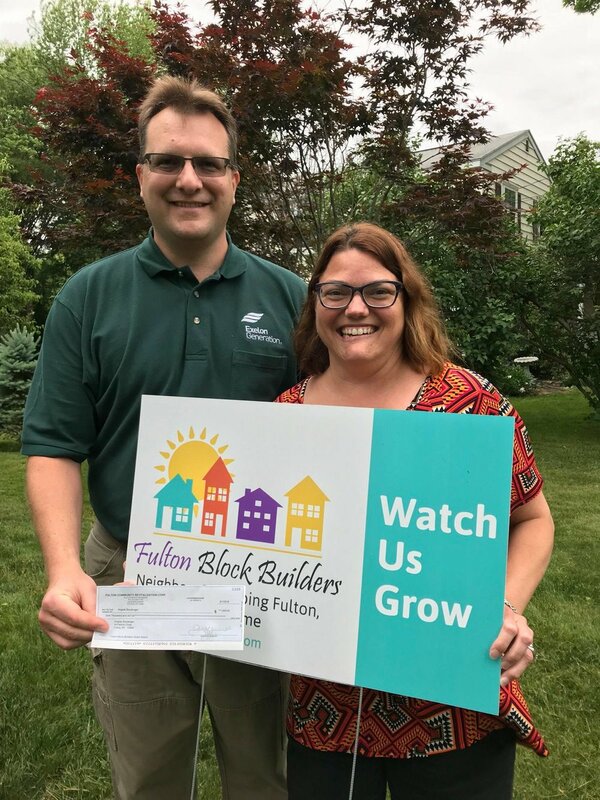 The couple has completed over $10,000.00 worth of exterior enhancements to their property, and Angela has taken on the responsibilities of the Block Leader. The Stoutenger’s improvements included replacing their roof, adding a Coventry wall and cleaning up all the landscaping. They’ve also added 3 new wall sconces trimmed up the tree in their front yard to open the view of their home and removed the satellite dish. “These last two items are just as important as the additions to their home,” said Linda Eagan, FBB director. “Not all improvements require much time or money. Separate from the projects each applicant outlines, they are also asked to indicate: A) one small thing you will add to your property to strengthen your neighborhood, and B) one small negative condition you can remove from your property. Examples of small things to add: hanging flowers, edging the lawn, putting out a new welcome mat, adding a porch flag, etc. Examples of negative conditions that can be removed: junk/ clutter on front porch or lawn, garbage cans that are routinely visible from the street, routinely tall (unmowed grass), unused satellite dishes on roof, etc. The Stoutenger’s are not only the first to finish they are an inspiration in the city,” Eagan concluded. Tonya Crisafulli and John Monk are the volunteer FBB Ambassadors for Stoutenger’s area of the city. Fulton Block Builders couldn’t have asked for a stronger start.